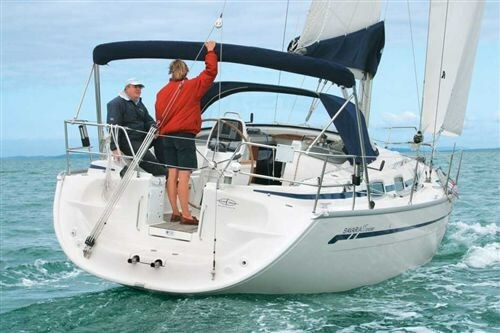 Small but surprisingly spacious, says Lindsay Wright, the Bavaria 37 is an excellent little cruiser that offers performance and good value for money. Writing a boat review starts out a bit like surveying the vessel, and just the first place to look is where the loading, from ballast keels and standing rigging on a yacht, are applied to the hull, to check that the structure there is beefy enough to take the strain. Any short cuts here will dog the vessel forever. So I dived straight below and while the boat gambolled across the Hauraki Gulf into the swell kicked up by a building southwesterly, I checked out the real heart of this cruiser fresh from Bavaria. Next the bulkheads and joinery – where they are accessible, there is generous fibreglass cloth tabbing between hull and bulkhead and no sign of any voids where the two meet. With the business part of the boat checked out it’s time to take stock of the domestic side of things. The first impression stepping below decks is one of space; this Bavaria is the three cabin version – two comfortable double quarter cabins and double cabin in the forepeak with an en suite bathroom and manual toilet. But the 37 also comes in two cabin format with the toilet aft next to a larger aft cabin. "We’ve found that this layout suits the kiwi lifestyle better," Gee explains. "In Europe they tend to sail from marina to marina, dine ashore or leave the boat there and go home ‘til next time. 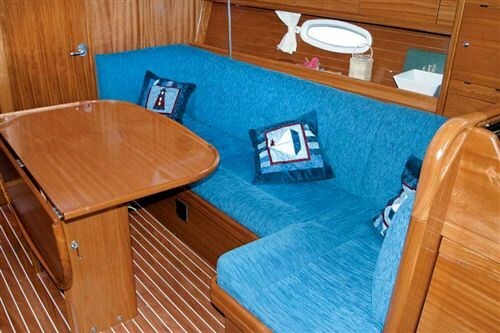 In New Zealand we live aboard our boats for extended periods of time and this layout suits us better. The 37 is similar to the boats we grew up with." Similar maybe – but better. 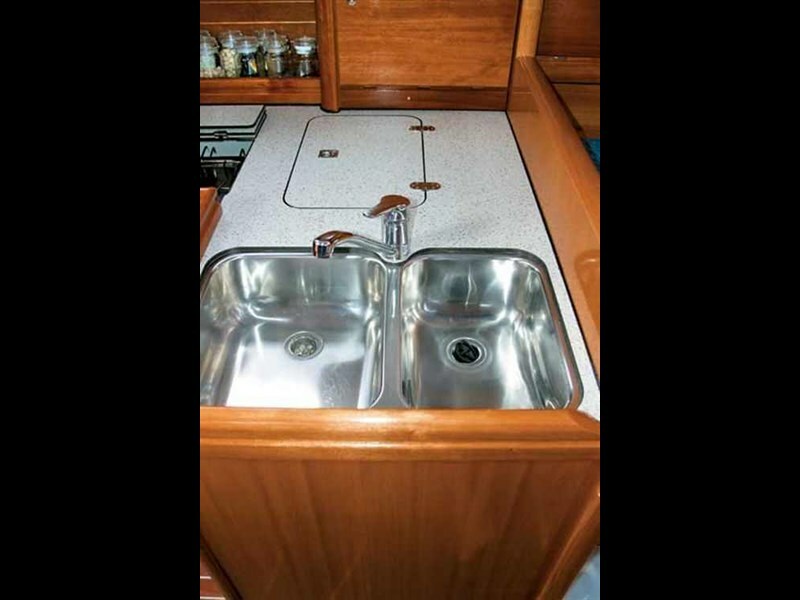 There are 15 Lewmar hatches which flood the mahogany saloon with natural light – even on a grey winter’s day – double stainless steel sinks and two-burner Bavaria branded stove with oven, none of which I remember from the boats of my youth. The standard Isotherm electric chest fridge is another Bavaria luxury which most older boats didn’t possess. Also standard are pressure hot and cold water, the heat supplied by engine exhaust or shore power while alongside. They draw from 210 litres of fresh water tankage, enough to keep a thirsty kiwi family irrigated through days of languid summer fun out on the anchor. Fresh water showers are also provided fore and aft – in the head and on the boarding platform – for post-swim rinse downs. "We put in other extra bits and pieces to suit the kiwi lifestyle – things like bigger batteries and beefier alternators to charge them," says Gee. "We had a range of Bavarias at the boat show – but this one was everybody’s sweetheart." Other alterations the company makes for the Kiwi market are the fully battened Halstrom mainsail though there are non battened or Selden in-mast furling alternatives. The Bavaria brochure says that the three-cabin layout sleeps six people but there’s actually room for eight. "You’d have Mum and Dad up forward, teenage daughter and her friend either side in the saloon, aunt and uncle in a quarter cabin and older son and whoever in the other quarter cabin." Another option which would be handy at this time of year is a Webasto diesel heater, a wonderful extra for making the most of midwinter sailing when no-one else is out on the water. I worked as skipper in a Caribbean charter fleet when the first European production boats arrived to replace the US-built dungers we’d been flogging around for years. I remember marvelling at the space and style of the new boats – they lifted the production boat bar from limbo level to high jump. Bavaria’s thoughtful design has lifted the bar a notch or two higher again. One immediate improvement is the light mahogany veneer interior which helps with the feeling of spaciousness – a sensation which doesn’t often happen in a boat this size with dark teak joinery. The Bavaraia 37 has 3.8m beam on her 11.35m overall length and carries her buoyancy well to the ends as a proper cruiser should. That generous beam and abundant natural light, also make her seem much larger. "There’s a perception that, because Bavarias reasonably priced, corners have been cut during production," says Gee, "but the low price is because efficiencies at the factory get passed on to buyers. You just have to look at the quality of the fittings: Lewmar hatches, Whitstock steering, Selden masts, Halstrom sails… "
Bavaria Yachts builds 2800 yachts annually (3500 including the power boat range), from 30 to 50 feet, at its factory in Giebelstadt; 150km from Munich – or five boats per worker per year. "It’s a family business – set up in 1979 by Winfred Hermann – who still manages it," says Gee. "His specialty is refining production systems – he works as a consultant for Volvo and BMW, helping make them more efficient too." Design work for the Bavaria range is done by the brothers Jakopin, Jernej and Japec (or J&J Design) of Slovenia who also have their own range of high tech carbon fibre racer/cruisers which are produced from the Bavaria factory as part of a contra deal. 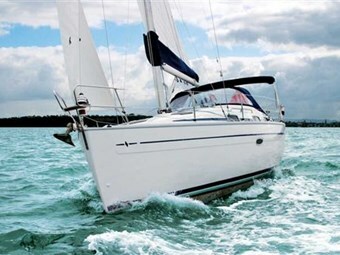 The Bavaria 37’s rakish modified fin keel, spade rudder and 35 percent ballast ratio are all ingredients for comfortable cruising. The hand laid hull is foam cored above the waterline for thermal and noise insulation and the foam cored deck is glued, screwed and glassed in to place. Plugging into the steep Hauraki Gulf chop the Bavaria 37 is dignified on deck, making good progress without throwing showers of spray around, but she is especially snug and comfy below. Underneath the cockpit is a 40hp, D2-40 three-cylinder Volvo. It reaches the water through a Volvo sail drive to power the 7000kg displacement boat at about eight knots maximum or a comfortable cruising speed of seven knots. "The 37 comes standard with a D1-30, that’s the 29 horsepower Volvo," says Gee, "but we find that, given the choice, Kiwis will always opt for a bigger motor, so the boats we sell here mostly have the bigger engine." The chart table has a lockable glove box in carbon fibre with instrumentation set into the same muted black nacelle. The surface area is big enough to spread a chart and pore over it but, long term, I think some form of cushioning would be called for on the moulded plywood seat. The Bavaria comes with a Raymarine electronics package and tacking was a simple matter of punching buttons and winding winches to sheet the 100 percent genoa in for the new tack. A stylish carbon fibre console at the wheel supplies all the information needed for wind direction and strength, depth, boat speed and position. The standard stainless steel wheel has a leather cover to keep the helmman’s fingers off cold steel and the Whitlock chain to cable and quadrant steering is positive and firm. Two huge, shallow cockpit lockers beggar belief – it almost takes another look into the quarter cabins to see how they could have been shoehorned in – and the cooking gas bottle sits snug in its own overboard vented locker aft. Cap shrouds to stay the twin spreader rig terminate well inboard and leave plenty of accessway for going forward and the Bavaria 37 feels good to confidently move around on. Hand rails and grips fall to hand exactly where they should be and a thoughtful little teak decking forward of the mast is provided for sunbathing in sunnier seasons. The Kiwi in and out of the water summer lifestyle is also well catered for with the teak decked boarding platform at the stern. A backstay adjuster is standard on the Bavaria 37, for cranking some shape into the 67.4m2 sail area. Herein lies a story with the Bavaria range. These portly cruising boats can sashay out there with the best of them on passage. Quintin Fraser has competed in two Auckland-Suva races with Bavarian Wave, a 44-footer, and won one of them. Calling a boat "cruiser" is easy, and many manufacturers do. But few make boats that will readily endure the hard work involved in following the cruising life. The Bavaria’s quality construction, high standard of equipment and roomy interior make her a true cruising boat and there are plenty of them out there doing it, to provide the proof. Some 70 Bavarias have been sold in New Zealand. The 37 costs about $300,000, depending on the exchange rate, for a brand new boat you could just about walk on to and sail away. Keep a close watch on the weather patterns before you leave – it is a bit late in the season after all – and Fiji/Tonga/or Vanuatu are only a week or two away.